Alicia's always known she's different--that she can recognize the mischievous fae when they show up to "play" with the humans. Only now she's faced with one highly annoyed dark fae and she's certain he knows the truth about her. She can see him, which means her life is forfeit. Add to that, his sister arrives, who wants to play, too. And their mother, the queen of the Denkar, will want Alicia's head, once she learns what Alicia can do. And all because Alicia was attempting to rescue her friend, Cassie, on their beach excursion at South Padre Island, from the wicked fae. Now, Alicia has really gone and done it--and she's thinking she should have let the fae have his fun. Her friend's broken heart would be a lot easier to deal with, than Alicia losing her life. But it is too late for regrets. As soon as she threw the soda at the dark fae's chest, she had declared war on the fae. And he is happy to take up the challenge. First Impressions: I was given a copy of Terry Spear's novel The Dark Fae back in January to read for review. The cover alone had me very intrigued to read her novel. I really love how it looks so dark and mysteries. It has been a while since I have read a story about fairies and these mythological creatures are one of my favorites. After reading more about the book from the synopsis, I figured why not give it a chance. Review: First you must know that this book is not very long; with only 152 pages the story is tightly packed and makes for a short but captivating read. In the beginning of the book it take place in the here and now; present day. Within a short amount of time the story diverts and the reader is taken into the fae world. I really enjoyed the way the author describes this "hidden" fairy world and the fae living in it. There are divided parts of the world in which different fae kingdoms rule. Deveron a dark fae from the kingdom of Denkar where he is the crowned prince. Deveron decides to go into the human world one day and comes upon a girl who can see these fae when no other humans can. But why? Deveron must now find out what and who she really is. Alicia has always been able to see fairies and does not completely understand why. On a vacation with her friend Cassie, Alicia see a gorgeous dark fae speaking with her friend and becomes worried. She knows he is not the good type of faerie. When she purposely spills some drinks on Deveron to try and make him leave, Deveron becomes very interested in Alicia only to later find out she is somehow able to see his kind. A plot turning event happens and Deveron will need to take Alicia into his world for her safety. From here the story plot advances with a exciting transformation which takes the reader into a magical world of fairies where both Deveron and Alicia soon come to learn who she really is. All the while forming a bond between both main character's. I felt that the love between Alicia and Deveron was quite romantic but for me a little to insta-love. Being a short novel I can understand why the author somewhat rushed the love between the character's but I would have liked the novel more if they had time to fall in love gradually and get to know each other better. The story in itself was pretty good and well written with only a few typos but nothing so bad that I would have felt inclined to stop reading. I felt that some parts of the book where slower than others. I did really love how descriptive the author was about the world in which she created in the book. The Dark Fae is definitely full of plot twists and turns; mystery and romance. If you enjoy a good fantasy with fairies within the YA-Adult age groups. Then this book is perfect for you and is short novel to read but not withing a Happy Ending! Final Thoughts: While I did not totally love this book I did enjoy it more than I thought I would. I really adore books about faeries and I knew I wanted to read Terry's novel as soon as I saw the cover. The lore in the book was very impressive but I felt a lacking in the character development. It would have been nice to know more in detail about each Royal fae kingdom and there traits. 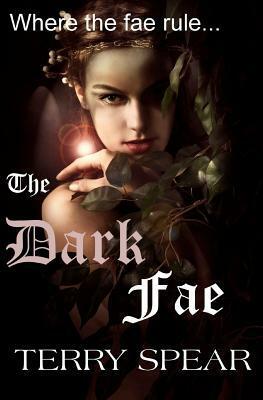 But otherwise the book "The Dark Fae" is a great fantasy novel and should definitely be given a chance to anyone who loves these type of books.